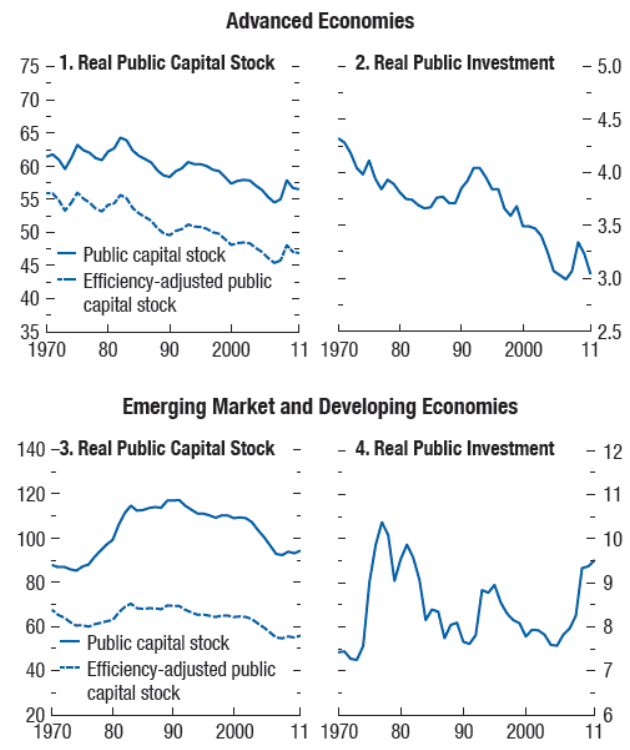 Moreover, insufficient private investment and declining real public investment have contributed to reduce the stock of public capital as a share of output over the past three decades (Figure 2). Furthermore, the economic collapse in the wake of the global financial crisis has contributed to permanent effects on potential output levels across advanced and emerging market economies (IMF 2015; Ollivaud and Turner 2014). Equity requirements and the cost of capital have increased for many infrastructure investments (McKinsey 2013, 23). This, in turn, combined with the decline in public investment as policy makers opted for austerity measures, has contributed to lower potential output (IMF 2014; Mckinsey 2016). 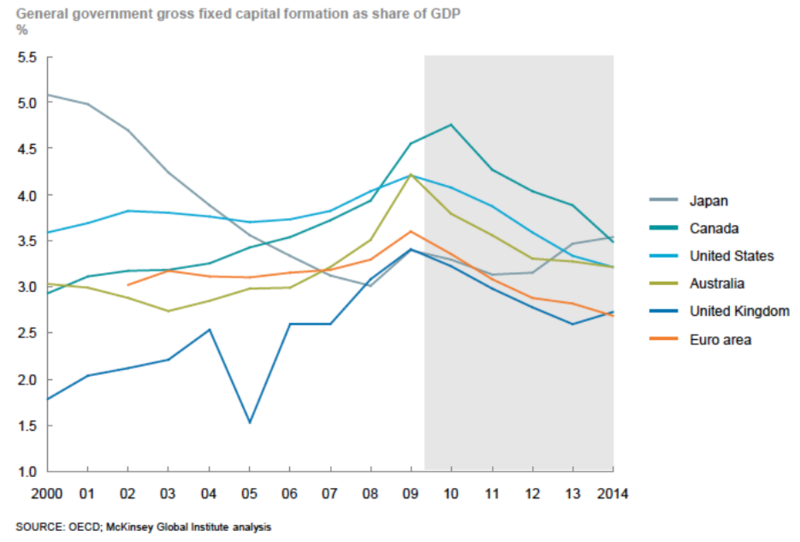 The decline in government investment has been exacerbated by the short-termism of financial markets and corporations. Additionally, an IMF report pointed out that “the initial hopes that the privatization wave of the 1980s would fuel a private-sector funded greenfield infrastructure investment boom have fallen well short of expectations” (Samama et al. 2016, 3). The perverse combination of inadequate direct public investment, rising costs and declining availability of long-term financing, and greater proportion of higher-risk projects in the investment pipeline (i.e., greenfield projects in developing countries) contributes to widen the infrastructure gap (McKinsey 2013, 19). 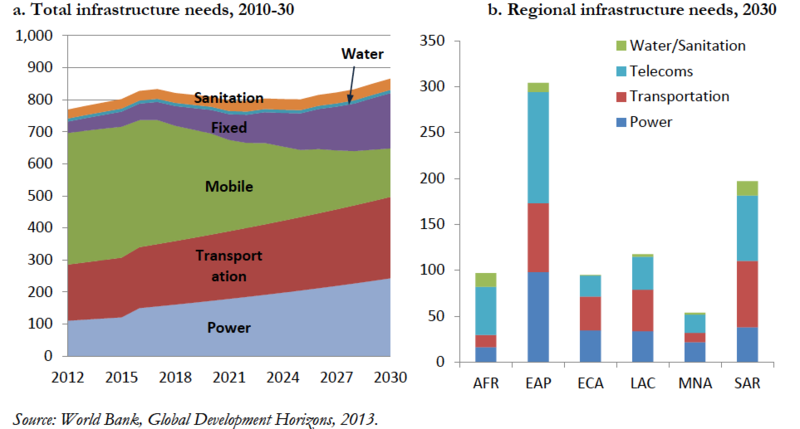 That is, although “infrastructure development has been found to have a positive and significant impact on long-run growth and a negative impact on income inequality” (Calderon and Serven 2014), the combination of growing investment needs, low investment, and the imperative to channel investments for sustainable development goals has caused massive infrastructure gaps (UNSDSN 2015; UNTT 2013; McKinsey 2016). Against this background, there are several estimates—using different approaches—that indicate massive global infrastructure needs (Schmidt-Traub 2015). For instance, the McKinsey report estimates that $57 trillion in investments will be required until 2030—which is more than the estimated value of today’s infrastructure—to just keep pace with projected global GDP growth (see McKinsey 2016, 1). The McKinsey report suggests that the world will need “to invest about 3.8 percent of global GDP in infrastructure over the period from 2016 to 2030—or an average of $3.3 trillion a year—just to support expected economic growth. Emerging economies account for some 60 percent of that need” (McKinsey 2016, 9). The report concludes that “[i]f they maintain their current trajectories, a number of countries will continue to underinvest to such a degree that the world could fall about 11 percent short of the necessary infrastructure investment. The shortfall could amount to some $350 billion a year… This size of the gap roughly triples, however, when we take into account the additional investment required to meet the UN’s new Sustainable Development Goals” (10). According to estimates from the Organization for Economic Co-operation and Development (OECD) the investment required is equivalent to $70 trillion by 2030 (OECD 2015). The World Bank (2015) estimates that approximately $1 trillion per year is needed in emerging markets and developing economies (EMDEs), while the G20 (2013) suggests that developing countries will need to invest an additional $1 trillion a year through 2020 (Figure 4). McKinsey points out that the current annual investment in infrastructure is between $2 trillion and $3 trillion and it estimates that required investments could reach the equivalent of $6 trillion a year, based on demand of about $93 trillion over 15 years. This means that the government sector, national development banks, and the private sector will have to substantially increase current rates of investment to meet the global demand for infrastructure services. 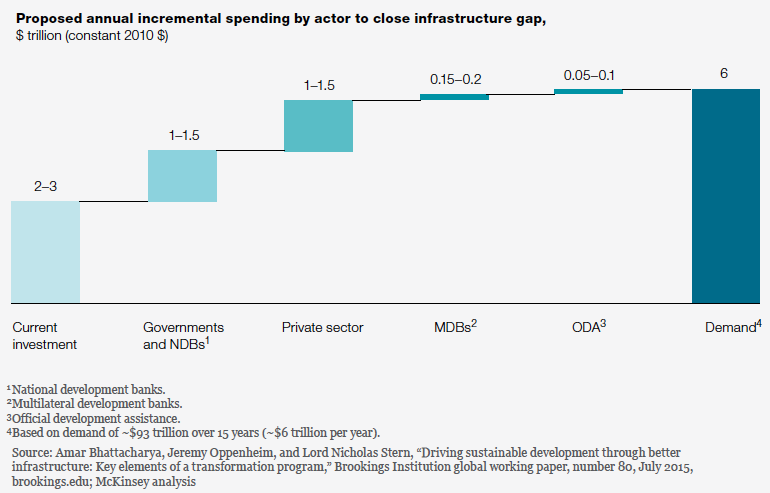 In particular, governments and development banks could be responsible for $1–1.5 trillion in annual incremental spending while the private sector would have to contribute equivalent amounts (Figure 4). The next post will discuss the challenges faced by banks, capital markets, and institutional investors as providers of long-term finance. Bhattacharya, A., J. Oppenheim, and N. Stern. 2015. Driving sustainable development through better infrastructure: Key elements of a transformation program. Brookings Institution Global Working Paper, No. 80, July. G20. 2013. “Long-Term Investment Financing for Growth and Development.” February. IMF (International Monetary Fund). 2014. “Legacies, Clouds, Uncertainties.” World Economic Outlook (WEO), October. Washington, D.C.
IMF. 2015. “Uneven Growth. Short- and Long-Term Factors.” World Economic Outlook (WEO), April. Washington, DC. McKinsey Global Institute. 2013. “Infrastructure Productivity. How to save $1 trillion a year.” January. Ollivaud, P., and D. Turner. 2014. The Effect of the Global Financial Crisis on OECD Potential Output. OECD Economics Department Working Papers, No. 1166. OECD Publishing. UNSDSN. 2015. Investment Needs to Achieve the Sustainable Development Goals. UNTT (UN Inter-Agency Task Force on Financing for Development). 2013. “Financing for sustainable development: Review of global investment requirement estimates” In UNTT Working Group on Sustainable Development Financing, Chapter 1. World Bank. 2015. Long-term Finance. Global Financial Development Report 2015-2016. Washington, DC: World Bank. Olá. Sou bibliotecária do BNDES e gostaria de ser notificada sobre novos posts sobre financiamento à infraestrutura. Obrigada.